Comment: Last and single gem of a trio of 'true chrome' diopside from Tanzania. 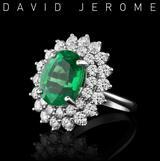 Magically deep green, no inclusions, no treatments, checkerboard cut with IGI report testifying the 'chrome' part of the beauty. 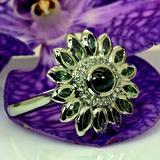 Will make an impressive but not flashy ring-gem for a ladies-ring in white gold or platinum.